Left, the location of the Horticulture Innovation Lab's office and demonstration center on the UC Davis campus. Find directions and parking information on the interactive campus map. Right, the external door and sign to the Horticulture Innovation Lab's office, Room 190 of the Environmental Horticulture Room buildings. The Horticulture Innovation Lab has an outdoor demonstration center on the UC Davis campus that is open to visitors. The demonstration center showcases technologies and practices used by the Horticulture Innovation Lab's network of researchers with small-scale farmers in developing countries. It is also a place where students, faculty and staff can test and demonstrate new horticultural tools — and was inspired by the Horticulture Innovation Lab's Regional Centers that serve farmers elsewhere in the world. 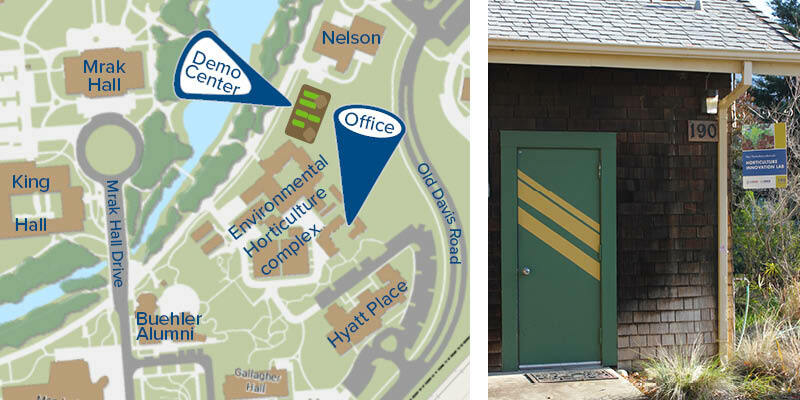 Find the demonstration center on the campus map, located on the edge of Solano Field and Arboretum Drive, near the Environmental Horticulture buildings. Room 190 of the Environmental Horticulture buildings is the Horticulture Innovation Lab's small office, near the demonstration center. Find the office on the campus map. The UC Davis campus is in Davis, California, about a 20-minute drive away from Sacramento and a 90-minute drive away from San Francisco. The general office phone number is (530) 752-3522, and inquiries can be sent to horticulture@ucdavis.edu. See the management team directory for individual contact information. The Horticulture Innovation Lab management team is part of the Department of Plant Sciences and closely associated with the International Programs Office, within the College of Agricultural and Environmental Sciences. Many of the students who work in the Horticulture Innovation Lab's office are pursuing degrees in International Agricultural Development (UC Davis offers both a bachelor's and a master's degree in this program of study). UC Davis researchers lead a number of the Horticulture Innovation Lab's research projects, which are awarded competitively to a wide variety of U.S. university researchers. See a complete list of UC Davis principal investigators, collaborators, staff and students who are part of the program's network.